Freetown is the capital and largest city of Sierra Leone, and a major port on the Atlantic Ocean. 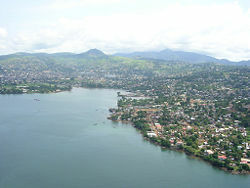 Freetown is the hub of the nation's administrative, financial, educational, communications, cultural, and economic center. The city of Freetown was founded in 1787, by Great Britain as a settlement for freed slaves who sided with the British during the American Revolutionary War that arrived in the city from 1787. However many of the first settlers died of disease. In 1792, 1,100 freed slaves landed on the Sierra Leone peninsula and founded Freetown. Freetown served as a destination for freed American slaves until about 1885. Their descendants, known today as the Krio, still live primarily in Freetown and its surrounding Western Area. The city has numerous landmarks that link the legacy of West Africans with their freed American and West Indies ancestors. Freetown's economy revolves largely around its harbor, which is the largest natural harbor in Africa, and the third largest natural harbor in the world. Freetown is the home of Fourah Bay College, the oldest university in West Africa, founded in 1827. The university not only played a key role in Sierra Leone’s colonial history, but also a key role in English speaking West African nations' colonial history. The city of Freetown is located on the rocky Sierra Leone Peninsula, on an excellent natural deepwater harbor at the tip of a range of wooded hills. The Freetown peninsula is ringed by long stretches of white sand. Lumley Beach, on the western side of the peninsula, forms a focal point for local parties and festivals. Like the rest of Sierra Leone, Freetown has a tropical savanna climate with a rainy season—May through October, the balance of the year representing the dry season. The beginning and end of the rainy season is marked by strong thunder storms. Freetown's high humidity is somewhat relieved November through February by the famous Harmattan, a gentle wind flowing down from the Sahara Desert affording Freetown its coolest period of the year. Average temperature ranges in Freetown are from 73°F (21°C) to 88°F (31°C) all year. Mean annual precipitation is 135 inches (3436 mm). Rapid population growth has put pressure on the environment, and overfishing has depleted fish stocks. Chemical pollution of water supplies was an issue in 2008. Construction of the Guma Dam, in 1967, has eased Freeport’s water shortage and provided more electrical power, although the dam was planned for a city population of 500,000, which in 2008 was over one million people. 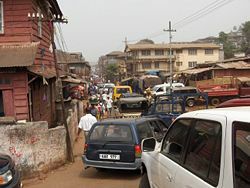 The East End of Freetown is the most populous of the three geographical regions of Freetown and with by far the highest poverty and crime rate in the city. Central Freetown includes the central business district, and is the location of Sierra Leone's tallest and most important buildings. 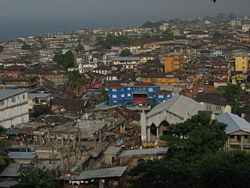 The city's informal housing settlement is at Kroo Bay, on the coastline of central Freetown. 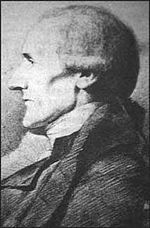 Granville Sharp, a British abolitionist who brought a group of 400 freed slaves from America to Sierra Leone in 1787. Sierra Leone has been inhabited for thousands of years, according to archaeological findings, peopled by successive waves of invaders. Portuguese explorer Pedro de Cintra, who visited in 1460, gave the name Serra Lyoa (Lion Mountains), later changed to Sierra Leone by the British. Portuguese ships began visiting regularly in the late 1400s, and for a while they maintained a fort on the North shore of the Freetown estuary. The Portuguese — and the Dutch, French, and English who arrived later—began acquiring slaves, initially through quick kidnapping raids, then through trade with local chiefs in return for European rum, cloth, beads, copper, or muskets. From the fifteenth century on, European traders congregated near the site of present-day Freetown, under the protection of African rulers, who exchanged ivory and slaves to be employed across the Atlantic for imported manufactured goods. During the 1700s there was a thriving trade bringing slaves from Sierra Leone to the plantations of South Carolina and Georgia where their rice-farming skills made them particularly valuable. The Treaty of Utrecht in 1713, resulted in Spain giving Britain the Asiento, a valuable exclusive contract for the sea-transport of enslaved Africans to North America and the Caribbean islands. Queen Anne's government (1702–1714) sold the exclusive rights to the South Sea Company to cover the costs of its participation in the war. 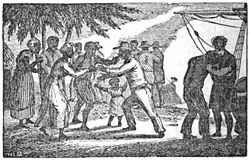 During the American Revolutionary War (1775–1783), enslaved Africans were promised freedom if they sided with the British, and many did. Under the auspices of British abolitionist Granville Sharp (1735-1813) a group of 400 freed slaves arrived in Sierra Leone in 1787 to form a settlement on land bought from local Koya Temne subchief King Tom and regent Naimbana, and establish the Province of Freedom near present-day Freetown. Disputes soon broke out, and King Tom's successor, King Jimmy, burnt the settlement to the ground in 1789. The London based Sierra Leone Company made a second attempt in 1792 and resettled Freetown with 1,100 American slaves en route from Nova Scotia, many of whom were born in the United States, led by former slave Thomas Peters (1738-1792). Sharp was instrumental in helping Peters receive a land grant, although the settlers were not allowed to take freehold of the land. These American slaves gave Granville Town the name "Freetown." Freetown survived being pillaged by the French in 1794. The indigenous inhabitants revolted in 1799. The revolt was only put down by the arrival of over 500 Jamaican Maroons, who also arrived via Nova Scotia. The British re-took control, beginning an expansion that led to the creation of Sierra Leone. Thousands of slaves were returned to, or liberated, in Freetown. Most chose to remain in Sierra Leone. These returned Africans were from all areas of Africa, and joined the previous settlers and together became known as Creole or Krio people. Cut off from their homes and traditions by the experience of slavery, they assimilated some aspects of British styles of life and built a flourishing trade on the West African coast. The lingua franca of the colony was Krio, a creole language rooted in eighteenth century African-American-English, which quickly spread across the region as a common language of trade and Christian proselytizing. In 1800, Sierra Leone was still only a small colony extending a few miles up the peninsula from Freetown. From 1808 to 1874, the city served as the capital of British West Africa. It also served as the base for the Royal Navy's West Africa Squadron which was charged with halting the slave trade. On August 31, 1896, a proclamation was issued in the colony declaring that territory to be a British "protectorate." In the early twentieth century, Freetown served as the residence of the British governor who also ruled the Gold Coast (now Ghana) and the Gambia) settlements. 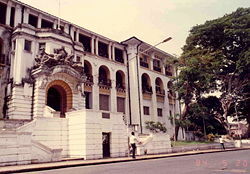 Sierra Leone also served as the educational center of British West Africa. Fourah Bay College, established in 1827, rapidly became a magnet for English-speaking Africans on the West Coast. For more than a century, it was the only European-style university in western Sub-Saharan Africa. During World War II (1939-1945), Britain maintained a naval base at Freetown. The 1924 Sierra Leone constitution was replaced in November 1951 by a new one which united the formerly separate colonial and protectorate legislatures and—most importantly—provided a framework for decolonization. In 1953, an African cabinet was installed (although the expatriate ministers it replaced remained in the legislature as advisers), and Dr. (later Sir) Milton Margai (1895-1964), an ethnic Mende and the leading politician from the protectorate, was named Chief minister. His title was changed to Prime Minister in 1956. Sierra Leone became independent of the United Kingdom on April 27, 1961, and Freetown became the country’s capital. Since that time, the city remained the center of Sierra Leone's hotly contested elections, coups, occupation by troops from Guinea from 1971 to 1973, civil war from 1991 to 2001, in which about 50,000 people were killed, and occupation by United Nations peacekeeping forces to December 2005. An explosion occurred on Free Street in downtown Freetown which killed at least 18 people on December 20, 2007. It was believed that the explosion was caused by the combination of a gas leak and fire inside a Nigerian-owned clothing store just off the main street of Freetown. Since the end of civil war in 2002, Freetown has experienced an increase in robberies, murders, carjacking, home invasion, and assault. This effect is most pronounced in the east end of Freetown, which has a higher crime rate than other parts of the city. Pickpocketing of cell phone and purses are the most common crimes in Freetown. Some of the high profile victims of crime in the city included Sierra Leonean businessmen Alhaji Lamrana Bah, who was shot and killed by armed men in his Mercedes Benz on February 16, 2008, in an apparent car-jacking. FannyAnn Eddy, the founder of Sierra Leone Lesbian and Gay Association, was murdered on September 28, 2004, shortly after she gave a speech to the United Nations in New York City, by a group of at least three men who broke into her office in Freetown, raped her, stabbed her, and eventually broke her neck. Another high profile victim of crime in the city was Kenneth Moore, a government building inspector, who was dispatched to demolish illegal structures erected on government property, who was murdered in a guest house in central Freetown by drug dealers. His case remains unsolved. 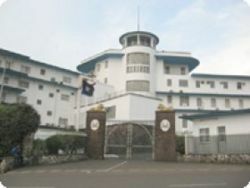 The State House, the official residence and principal workplace of the President of Sierra Leone. Sierra Leone is a constitutional democracy in which the president, who is elected by popular vote for a five-year term, and is eligible for a second term, is both the chief of state and head of government. Ministers are appointed by the president with the approval of the House of Representatives. The unicameral parliament has 124 seats, in which 112 members are elected by popular vote, and 12 seats are filled by paramount chiefs elected in separate elections, all to serve five-year terms. Democracy was being re-established after the civil war that lasted from 1991 to 2002, that resulted in up to 50,000 deaths and the displacement of more than two million people. The military, which took over full responsibility for security following the departure of United Nations peacekeepers at the end of 2005, is increasingly developing as a guarantor of the country's stability. The government's priorities include furthering development, creating jobs, and stamping out endemic corruption. The republic is composed of three provinces: The Northern Province, Southern province and the Eastern province, and one other region called the Western Area. The provinces are further divided into 12 districts, and the districts are further divided into chiefdoms, except for the Western Area. 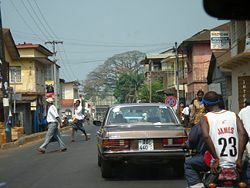 Freetown is the capital of the Western Area urban and rural districts. The city is governed by a city council, which is headed by a mayor, in whom executive authority is vested. The mayor is responsible for the general management of the city and for seeing that all laws are enforced. The residents of Freetown elect the mayor directly. Sierra Leone is an extremely poor nation with tremendous inequality in income distribution. While it possesses substantial mineral, agricultural, and fishery resources, its physical and social infrastructure is not well developed, and serious social disorders continue to hamper economic development. Nearly half of the working-age population engages in subsistence agriculture. Per capita GDP was estimated at $600 in 2007. Freetown is the economic, financial, transport, cultural and education center of Sierra Leone. The city's economy revolves largely around its fine natural harbor, which is the third largest natural harbor in the world, and has a deepwater dock at the Queen Elizabeth II Quay. The country's national television and radio stations, the Sierra Leone Broadcasting services is primarily based in Freetown. The country's largest corporations and international companies operating in the country have their head offices in Freetown. Freetown's industries consists mainly of the processing of raw materials and of light manufacturing for the domestic market, and include fish packing, rice milling, petroleum refining, diamond cutting, and the manufacture of cigarettes, paint, shoes, and beer. Exports include palm oil and kernels, cocoa, coffee, ginger, and kola nuts. The Freetown harbor is a major commercial shipping port and handles Sierra Leone's main exports. 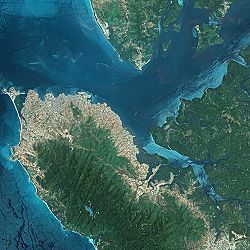 The city is served by the Lungi International Airport, located in the city of Lungi, across the sea from Freetown, and Hastings Airfield, which is 10 miles (16km) to the southeast and handles domestic flights. Passengers have the choice of hovercraft, ferry, or a helicopter to cross the river to Freetown. Freetown had an estimated population of 1,070,200 in 2006, which was about 16.1 percent of Sierra Leone's total population. The Krio people (descendant of freed African Americans and West Indian slaves that landed in Freetown between 1787 and about 1885) form the single largest ethnic group in the city at about 29 percent of the total population and 10 percent of Sierra Leone's population in total. Otherwise, the city is home to significant numbers of all of the country's 20 African ethnic groups, of which the Temne make up 30 percent, Mende 30 percent, other 30 percent. The Krio language, a native language of the Krio people, is spoken at home as a first language by 90 percent of the population and is the lingua franca of the city. English is the official language, although regular use is limited to a literate minority. Freetown is the seat of St John's Maroon Church, which was built around 1820, St. George's Cathedral, completed in 1828, and Foulah Town Mosque, built in the 1830s. Muslims make up 60 percent of the population, Christians 10 percent, while 30 percent follow indigenous beliefs. Freetown is home to one of the country's two main universities, the Fourah Bay College, the oldest university in West Africa, founded in 1827. The university not only played a key role in Sierra Leone’s colonial history, but also a key role in English speaking West African nations' colonial history. The college’s first student, Samuel Adjai Crowther, went on to become the first indigenous Bishop of West Africa. football is the most popular sport in Freetown, and the Sierra Leone national football team, the Leone Stars, play at Freetown's National Stadium. Eight of the 15 clubs in the Sierra Leone National Premier League are from Freetown, including two of Sierra Leone's biggest and most successful football clubs, East End Lions, and Mighty Blackpool. The city hosts a We Are The Future center, a child care center managed under the direction of the mayor’s office, and the international NGO Glocal Forum. Launched in 2004, the program is the result of a partnership between the Glocal Forum, the Quincy Jones Listen Up Foundation, and Hani Masri, with the support of the World Bank, United Nations agencies, and major companies. Main street in the east end of Freetown showing the famous Cotton Tree, which has been there since 1787. King's Gate, which was erected in stone with a statement inscribed which reads "any slave who passes through this gate is declared a free man." The Cotton Tree, which is a treasured symbol of the city, is in the east of Freetown. It was planted by the resettled American slaves with the founding of Freetown. The Con Naught Hospital, which was the first hospital to use western medical practices in West Africa. Slave steps carved out of stone near the Naval Wharf, was where Portuguese slave traders bought and sold many Africans, and from where numerous slaves made their last footsteps on African soil. The National Railway Museum, which exhibits a coach built for the state visit of Elizabeth II in 1961. It also contains historical documents and traditional wood and stone sculptures. The Big Market on Wallace Johnson Street is the showcase for local artisans’ work and the place to pick up a bargain souvenir. Freetown was founded as a settlement for freed American and West Indian slaves, and the city's name, the King's Gate, the Cotton Tree, and the Slave steps all serve to remind of abolitionist Granville Sharp's utopian vision. Since independence in 1961, hotly contested elections, coups, occupation by troops from Guinea from 1971 to 1973, civil war from 1991 to 2001, killing about 50,000 people, and occupation by United Nations peacekeeping forces until December 2005, has hampered development of the nation's substantial mineral, agricultural, and fishery resources. The city has problems with pollution, limited water supply, a substantial shantytown, as well as poverty and high crime. A government appointed commission that analyzed the causes of the civil war concluded that it was fought over who controlled power and the benefits it conferred. Corruption, prompted the outbreak of civil war, is still deeply entrenched. School and health supplies disappear or are sold for personal profit. A "me-first" philosophy and practice seems to prevail over the public good. Before United Nations troops were withdrawn in 2005, UN Secretary General Kofi Annan noted that while Sierra Leone had made progress toward peace, it needed "concrete steps aimed at addressing the root causes of the conflict and nurturing a culture of human rights." As the capital city and center of Sierra Leone in many respects, Freetown bears the burdens of the nation. To alleviate the problems facing the nation, the city, and its people it is imperative that effective action be taken. Bangura, Abdul Karim. 2005. "Freetown." Encyclopedia of African History. OCLC 62196358. Banton, Michael. 1957. West African City; a Study of Tribal Life in Freetown. London: Published for the International African Institute by the Oxford University Press. OCLC 561114. Clifford, Mary Louise. 1999. From Slavery to Freetown: Black Loyalists after the American Revolution. Jefferson, NC: McFarland. ISBN 9780786406159. Shaw, Rosalind. 2002. Memories of the Slave Trade: Ritual and the Historical Imagination in Sierra Leone. Chicago: University of Chicago Press. ISBN 9780226751320. World Fact Book. 2008. Sierra Leone. Retrieved November 5, 2008.